Origin and Habitat: Southern Peru, Northern Chile. ENGLISH: Old Man of the Andes. Description: Oreocereus hendricksenianus is a clustered columnar cactus that form groups up to 1.4 m tall and 2 m in width. At first the body is club shaped, becoming cylyndrical with age, though growth is slow. 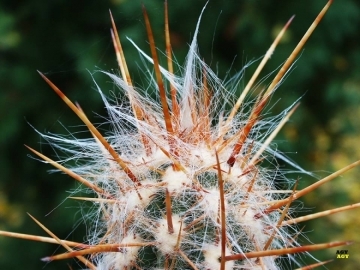 The beauty of this plant lies in the covering of silky white, yellowish, red-brown to black hair, completely concealing the stem, protruding through which are stout, brightly coloured spines. 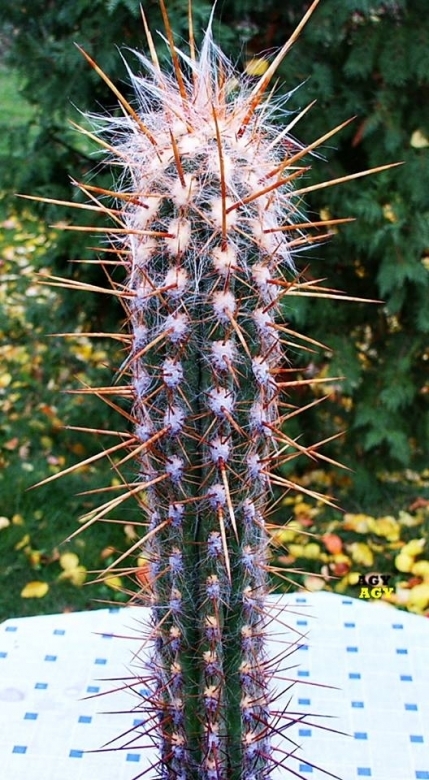 Oreocereus hendricksenianus is very similar in appearance to Oreocereus ritteri, with the added attraction of more hair colours. The chocolate-coloured form is most unusual, and it comes in yellow and white as well. Usually chocolate-coloured form produce hair of chocolate colour only on new growth, but soon bleaching. Remarks: Oreocereus hendriksenianus, nowadays is considered by most authors to be a variety of Oreocereus leucotrichus, thought some other authors still considered it a different species. Stem: Columnar, erect, branching from base,1(-1.4) m tall, almost 10 cm thick, green. Ribs: Ribs 10, with a transverse furrow, which is completely obscured by the mass of hairs between the areoles. Radial spines: 8-9 (-10) fine no more than 1 cm in length. Flowers: Pink to carmine red, around 7 cm long, tubular, zygomorphic and densely hairy.